I’ve been a little off the radar this month and I’m not actually sure why as I’ve had quite a bit of spare time on my hands… I’ve just been rubbish! So to make it up to you all I have done a blog recipe on how to do perfect American style fluffy pancakes, because who doesn’t love pancakes?!?! This recipe makes around 9 medium pancakes, which we quickly demolished between three of us. I think next time I will be doubling the mixture! Check out my vlog recipe here and below the full recipe. I hope you like it! Serve with lashings of real maple syrup and icing sugar! I am a firm believer that you get your summer beach bod in the winter and as hard as it is to keep away from the stodgy foods and cakes, I’m going to really try my hardest this winter. I also get super bad chapped lips in the winter and I mean super bad, it definitely doesn’t help that I have a habit of biting off the skin on my lips (ew I know). So I’m interested to see if by upping my vitamin intake over the winter it will help with my chapped lips and also with maintaining my weight and helping me get summer ready! I came across a great green smoothie recipe on Lauren Conrads blog (http://laurenconrad.com/blog/2013/04/good-eats-3-busy-girl-breakfasts-overnight-oats-green-smoothie-allison-norton-2013/) which I LOVED the look of. However I’m not a massive fan of almond milk or coconut, plus I didn’t have any protein powder and I didn’t want to spend a huge amount of money on this one smoothie. So I altered the recipe slightly and came up with the amazing tasting recipe. I was really surprised about how nice it was! I like fruit, however I have to admit I do find it hard eating it and I’m so happy to find a better way to get my 5 a day rather then having 3 applies and an orange lined up on my desk and gearing myself up to eating each one. This way you get about 4 of your 5 a day in one glass, plus the frozen fruit makes the smoothie really refreshing and would be perfect as a cooling drink in summer. Overall I am so impressed, the fruit, thickness (which I think is down to the frozen fruit and flaxseed) make this a really filling drink, I had this with a banana for my breakfast and I was full right up to lunch. Blend spinach and water until smooth. Next, add the remaining fruits and blend again. Then drink up! p.s – one word of warning… this will make you fart like crazy and make them smell pretty bad! I put it down to the fibre in the flaxseed and the smoothie really cleaning out my system. But yeah it will make you fart like a trooper. 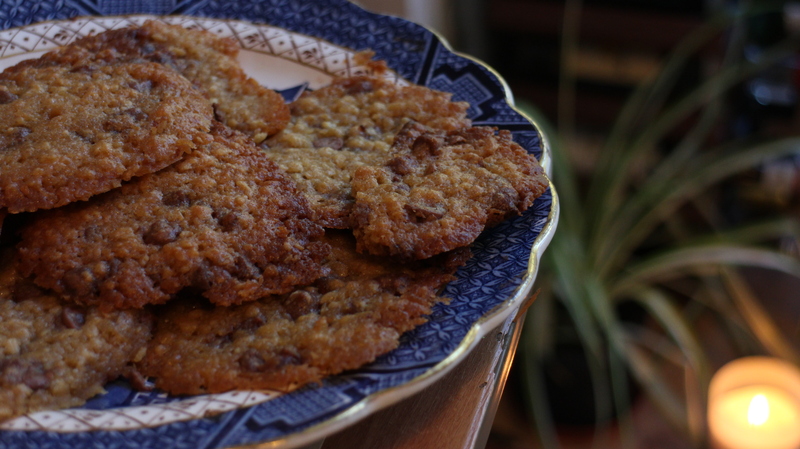 I wanted to do something with the big bag of oats I have sat in my pantry and I found this amazing recipe on Pinterest and with a few adjustments I have the best chocolate chip and oat cookie recipe – these are seriously good. I think it’s come to that time of year where all I want to do in the evenings is stay inside with a cup of tea and a biscuit and watch rubbish TV. These are the cookies you want to be doing that with! Preheat oven to 375 – gas mark 4. Beat butter and sugars with an electric mixer until smooth. Add egg and vanilla, mixing well until combined, about 2 minutes. Stir in flour, baking powder, salt and with the mixer on medium speed. Beat in oats. Mix until dough comes together. Add in 1 tablespoon milk if the dough is crumbly. If dough is still crumbly, add milk 1 tablespoon at a time until it comes together. Fold in chocolate chips. Refrigerate for 30 minutes. I never really make bread, so I’ve wanted to try a few recipes out in hope that it will get me loving making bread more! Combine the water, yeast and sugar in a bowl. Set aside in a warm, draught-free place for 5 minutes or until frothy. Combine the flour and salt in a large bowl. 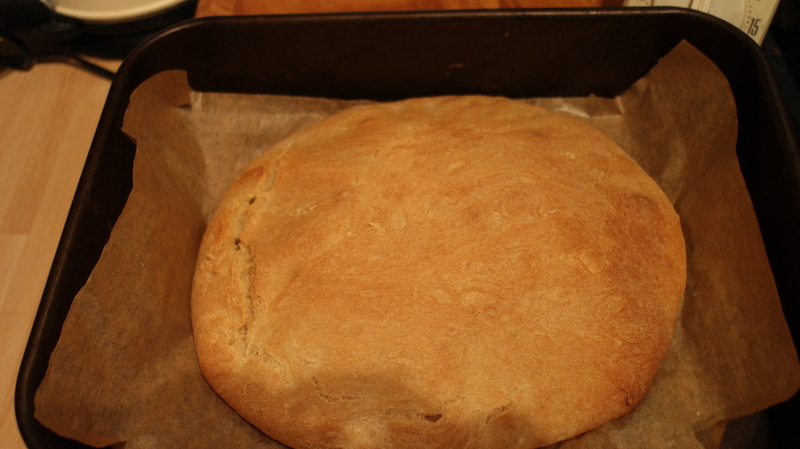 Make a well in the centre and pour in the yeast mixture. 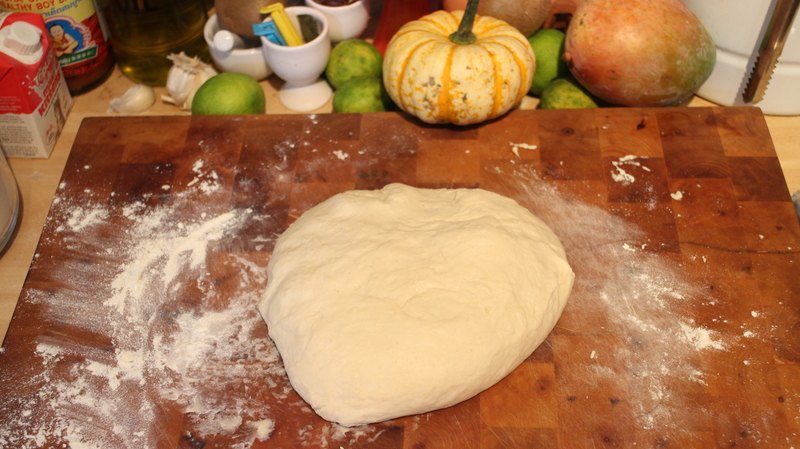 Use a wooden spoon to stir until combined, then use your hands to bring the dough together. Preheat oven to 210°C. Brush a pan of your choice (I used a simple baking tray as I wanted a round loaf that was ‘rustic’) with oil to grease. Punch down the centre of the dough with your fist. Turn onto a lightly floured surface and knead for 2 minutes or until dough is elastic and has returned to original size. Place your dough in the pan in the shape you would like your loaf to be. Cover with a damp tea towel or cling film and set aside in a warm, draught-free place to prove for 30 minutes or almost doubled in size. Bake for 30-35 minutes or until golden and loaf sounds hollow when tapped on the base. Combine the butter and garlic until it makes a paste. 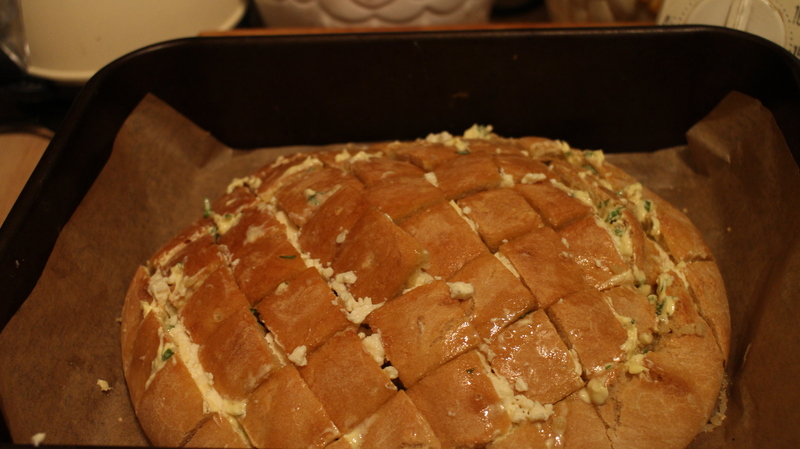 Cut the bread in a criss cross pattern only cutting down half way so the bread stays together and spread the butter and garlic into the gaps of the bread. Then cut the feta into slices and insert into the gaps. Put loaf back into the oven for 10 minutes or until feta is slightly melted. Serve warm or at room temperature. 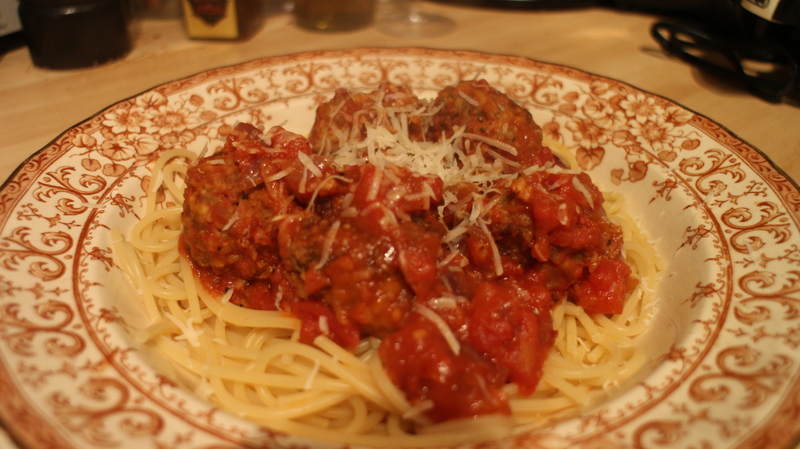 I had this with homemade meatballs and it was so good. I have to admit I made way too much for the two of us so I’ve put the other half in the freezer. I’m not sure how it will freeze but I will let you know when we defrost it! Follow me and subscribe to my YouTube Channel if you liked this, I post videos every Sunday and I also try to post one during the week also. I love a good get ready with me video, I hope you enjoy this as much as some others you may have watched! See below for products used and links to my blog and other social media sites. My friend Jamie made bacon and maple syrup cupcakes which I saw on Facebook and they looked AMAZING. So I wanted to spend my Saturday doing some baking. 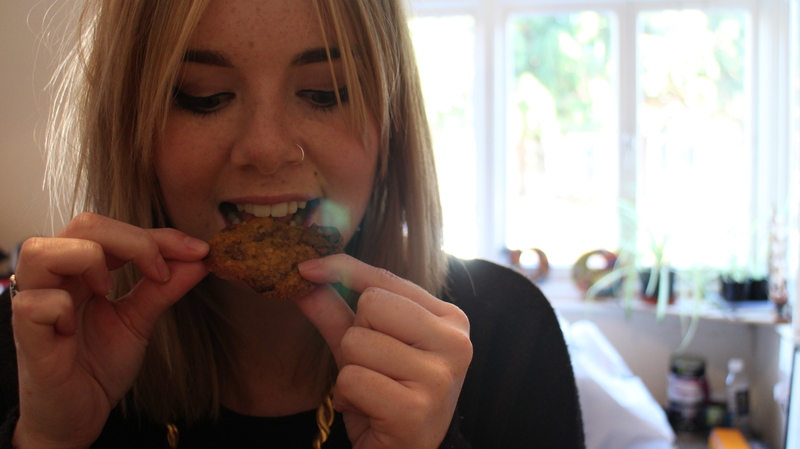 They were seriously good – I would definitely recommend making these. Check out below for the full recipe and let me know what you think! Preheat the oven to 180ºC/350ºF and line a 12-cup tin with paper cases. Next fry the bacon rashers in 1 teaspoon of oil until crisp. Remove to a plate lined with kitchen paper and allow to cool. Once cool, crumble them to resemble sprinkles. Set aside. In a bowl, combine together flour, baking powder, bicarb and salt. Cream together the butter and sugar, using a freestanding mixer, handheld electric mixer or just a bowl and a wooden spoon. Then beat in one egg, followed by half the dry ingredients, mixing well before adding the second egg and the remaining dry ingredients. Again, mix well, and then add the yoghurt and maple syrup, beating and folding to give a smooth batter. Divide the mixture among the cupcake cases and bake in the oven for around 20 minutes until a case tester comes out clean. Turn the cupcakes out on to a wire rack to cool completely before icing. To make the buttercream icing blitz the icing sugar in a food processor to remove any lumps. Then add the butter, blitz again and then add the maple syrup down the funnel with the motor running, till you have a smooth buttercream. If you sieve the icing sugar, obviously all this can be done by hand, too. Once the cupcakes are completely cool, top with the buttercream, using the back of a spoon to make a spikey effect, and adorn with your bacon sprinkles.